There is a well-established precedent for the second film in a trilogy or series being the best entry. The Empire Strikes Back. T2. Spider-Man 2. The Dark Knight. One could make an argument for all of these. 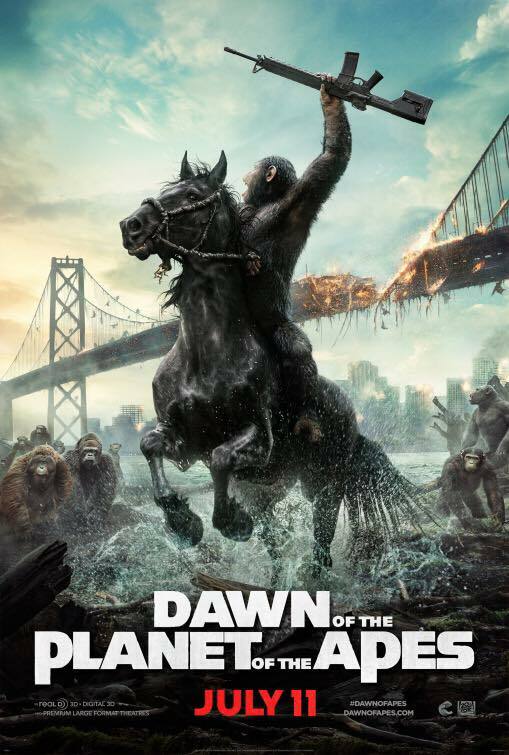 However, when considering Dawn of the Planet of the Apes, there really can be no debate. Rise is a very good movie, but it's clear it was just a warm-up. Dawn is a superior film in virtually every way. This series cleverly skips over the parts of the post-apocalypse that we've seen dozens of times. We don't need to see this world fall; it's already fallen. It also skips over the chaotic and lawless period just after the fall, and the film opens with a humanity that is stumbling, yes, but is almost back on its feet. Dawn wisely ignores the more tropey bits in favor of more interesting story-telling, and that is certainly a strength. Ten years after Rise, humans have all but disappeared, wiped out by what humans dubbed the Symian Flu, though that is a misnomer, as the virus was a thing of mankind's making. Then the intrusion of a small band of humans into the apes newly founded home brings Caesar into contact with Malcolm, the lead human character played by Jason Clarke. In Malcolm, Caesar recognizes someone very much like himself: a family man with a wife and a son, just like Caesar's. They are just two figures trying to find the best way to help their people survive. This common ground serves as the impetus for an uneasy truce. Caesar has already lost one home and one family, his human one. His reticence to form another bond with a human is plain, and while he once loved a human man, his "father", his well-earned distrust of mankind is clear. His fierce determination to protect his new home and ape family drives him, and wars with his desire for peace. Any group of people will always rise and fall on the character and strength of its individuals. This truth is at the forefront of this film, and is true of both the apes and the humans alike. Both parties have things they can offer the other. We get to see Caesar as the leader he has become, as he consistently makes wise decisions while the humans consistently make foolish ones. Mankind's folly is on full display here. But both sides have peace-keepers, and both sides have aggressors. After a tragic incident between a human and an ape, Koba, Caesar's right-hand ape and a fierce warrior in his own right, is the one championing the cause of war, and he has every reason to hate humankind. He can literally count the scars on his own body and number them as the reasons mankind cannot be trusted. Koba simultaneously decries the violence of the humans, but is fascinated by their weapons. He speaks against the ways of mankind, while simultaneously urging his people to wage battle with them. Koba hates the humans, but it is a hate learned from humanity themselves. In a very real way, he becomes the thing he hates. Which is another truth this film gets so right: hate breeds hate. The movie does an excellent job of making you route for the apes, and making you see humanity as a whole as the villain. But the Apes in Dawn must learn the same lesson that the humans learn in Rise: the greatest danger rarely comes from without; it comes from within. With a fracture of betrayal forming in Caesar's group of apes, and war with the humans brewing, Caesar must learn some hard lessons and make some tough decisions, including the realization that perhaps humans and apes are not so different from one another. Both are capable of great things, both good and evil. And just as there are bad apes, so there are also good men. The escalation of this story is impressive, from the small, perfectly executed character moments early on, to the ramping up of the rising action, all the way through to the heart-wrenching conclusion. Director Matt Reeves takes an excellent script and drives it home, and I can't wait to see not only the conclusion to this trilogy, but Reeves next project, the first Ben Affleck led solo Batman film. If you haven't seen this series, you should. Don't let the idea of anthropomorphic apes stop you, like it almost did me. This series is not only excellent, but is an entirely believable and emotional story.